The Expert Advisor is designed for trading multiple currency pairs simultaneously. The minimum deposit is 500 USD. The currency pair and the timeframe of the chart do not matter. The EA opens an order for a certain currency pair against the price momentum, that is, when the price exceeds the High/Low of the previous bar. The bar for calculation is specified in "Time frame to work EA". 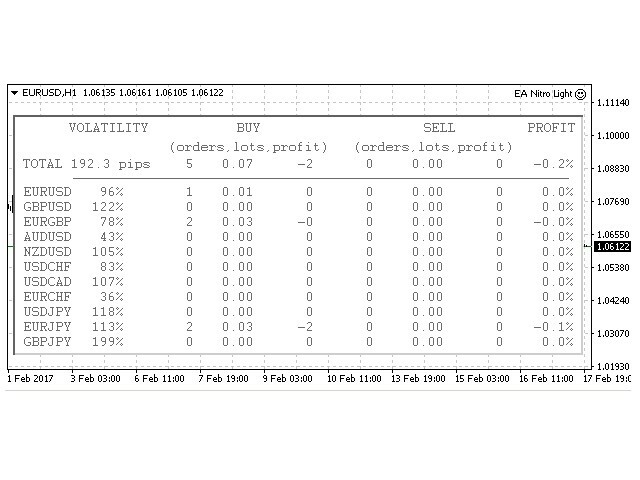 If the price moves against the opened order, the EA opens additional orders at a certain number of points, depending on the calculated volatility for the specific currency pair based on the value specified in "Grid step". Volatility is calculated as the deviation from the average volatility value for all currency pairs specified in the EA settings. The average volatility value of the currency pairs is calculated based on the High and Low prices for the specific currency pair. The bar for calculating the average volatility value is specified in "Bar for calculating volatility". Next, the EA iterates over all possible combinations of currency group pairs consisting of three currency pairs and the calculates the profit of such currency pair groups. If the profit of the currency pair group exceeds the value specified in "Take profit (% from balance)", the EA closes the currency pair group. In case the time from the opening the first order in the currency pair group is greater than the number of minutes specified in "Minutes for take profit", the EA closes such group of currency pairs upon reaching the profit specified in "Minimum take profit (% from balance)". Open positions are locked in the cases when the number of open orders reaches the value specified in "Maximum number of open orders". For the partial closure of locks, the EA uses 4 different combinations of orders by opening time: the first locking order and the first orders, the first locking order and the last orders, the last locking order and the first orders, the last locking order and the last orders. 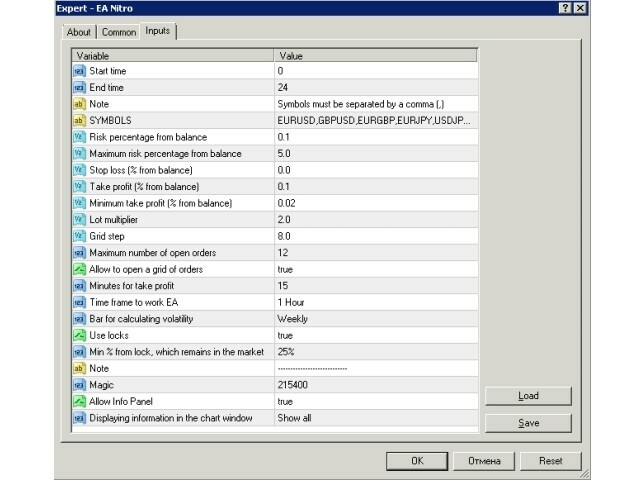 For each combination, the EA calculates the profit, and if the profit value is greater than the one specified in "Minimum take profit (% from balance)", the EA closes the locking order and a number of opposite orders, so that the number of lots remaining in the market is not less than specified in "Min % from lock, which remains in the market". Stop loss (% from balance) - stop loss as a percentage of balance. Used for limiting the losses, the EA closes all trades once reached. Minimum take profit (% from balance) - minimum take profit as a percentage of the balance. 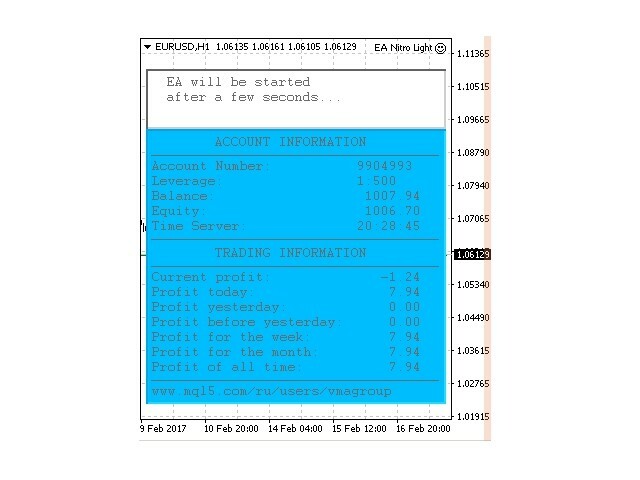 It is activated in the cases when "Take profit (% from balance)" was not triggered during the time specified in "Minutes for take profit"
Minutes for take profit - the time in minutes, during which the EA is allowed to close orders by the take profit specified in "Take profit (% from balance)"
Good EA, it works ! Good idea, good EA, good support. Five stars.